I recently mentioned wanting to try the pumpkin pancakes at Cafe Orlin. I didn't end up trying the pancakes, but really enjoyed what we did order. My friend and I agreed to meet up here at 11:30am on a Saturday (I love it when friends are okay with brunching before noon!) The restaurant does not accept reservations, but luckily we only had to wait around 20 minutes. 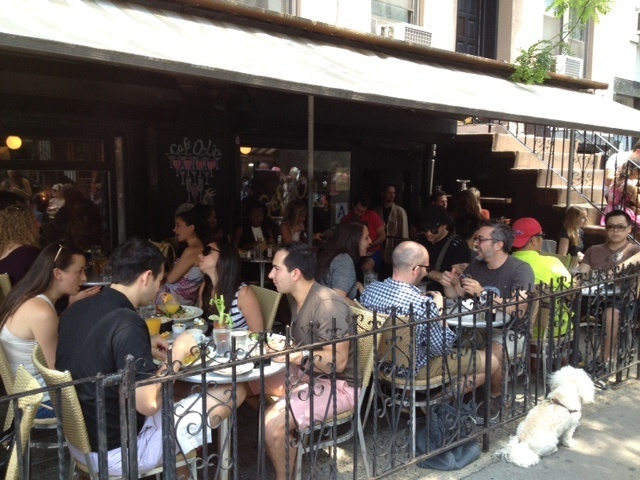 Cafe Orlin is open until 2am every day, and serves a great brunch with traditional options such as pancakes and eggs, but also Middle Eastern dishes like falafel and hummus. 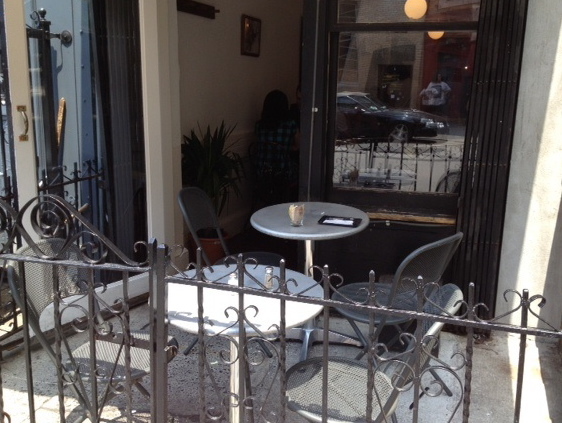 We were seated in this separate little patio! (There's a staircase that divides this area from the main one in the picture above. We probably spent a good 15 minutes deciding what to order. So many appealing choices! I was deciding between Eggs Benedict, Eggs Blackstone, and the Middle Eastern Breakfast (2 eggs with Labana cheese, zataar, and served with Israeli salad and pita). 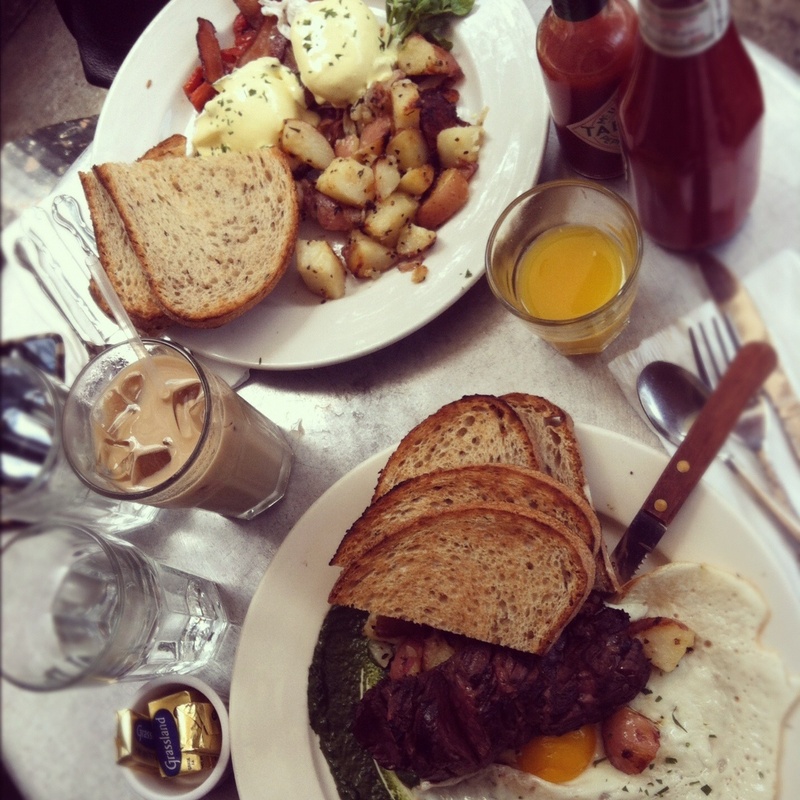 Eggs Blackstone: bacon, sauteed tomatoes, poached eggs and hollandaise, $14.50. Several brunch options including this dish, are served with fresh orange juice and cappuccino/latte/tea. Steak & Eggs: 2 eggs any style, home fries, toast and creamy spinach, $15. A brunch cocktail could be added to select brunch items including this dish for an additional $6. The steak was a little bit chewy, but tasted very good. The middle was pink, as it should be when cooked medium. Note that there's a credit card minimum: $15. American Express not accepted.